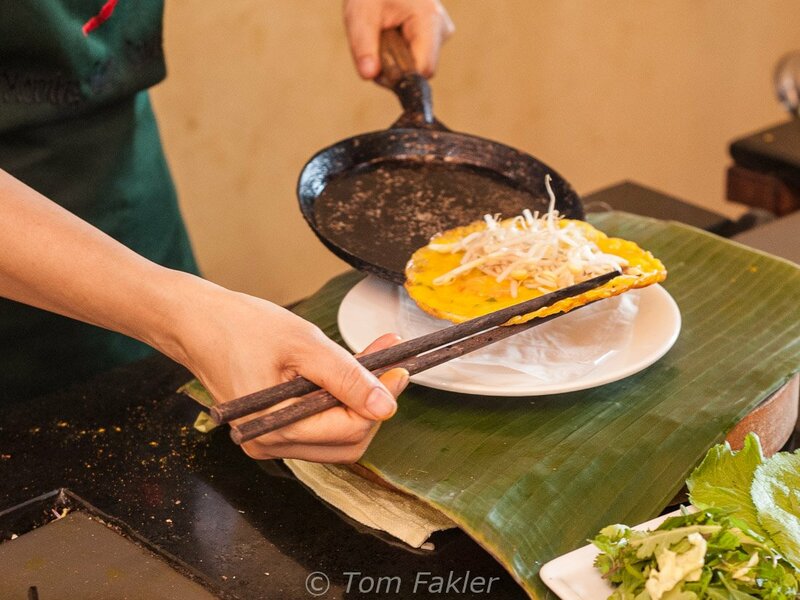 Vietnam’s crepe-like pancake, banh xeo, is a delightful, messy, savory culinary experience. From Saigon pancake in the south to the smaller rounds served up in Vietnam’s central and northern regions—the savory wrapper, enclosing bits of seafood, meat, and crunchy mung bean sprouts tucked into a heap of herbs and leaves is one of the best ways for traveler in Vietnam to “eat your greens”. 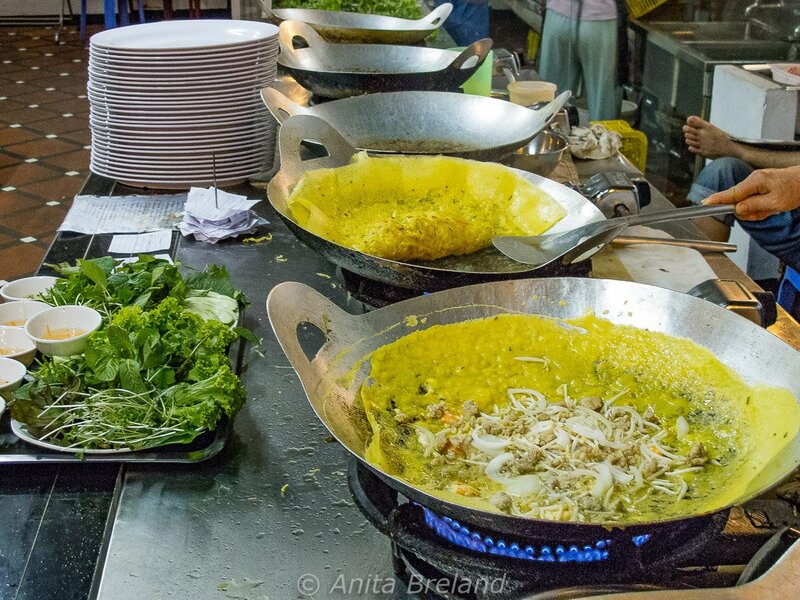 This bank of woks in a Cambodian restaurant kitchen produces very fine Saigon-style banh xeo! 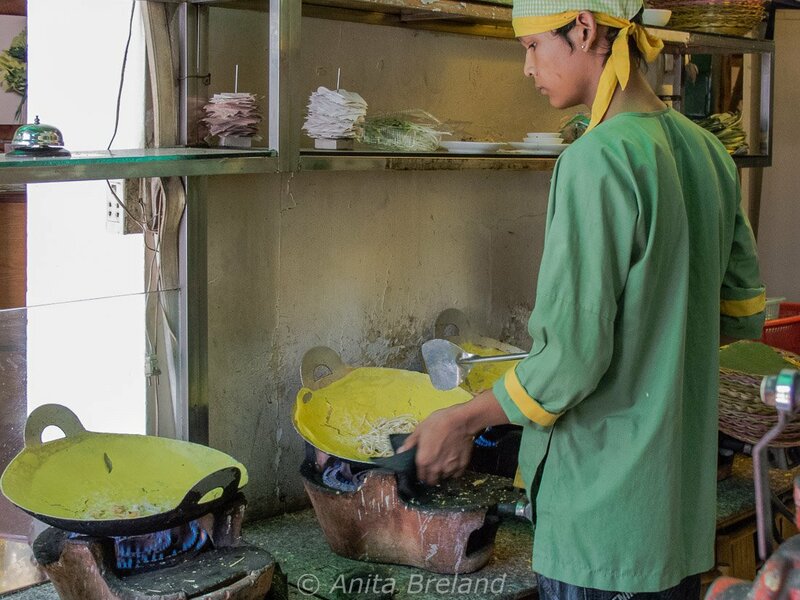 The terrace kitchen of Magnolia in Phnom Penh, Cambodia serves up a great Saigon pancake. The restaurant offers options for dining in a garden, on a balcony or in air-conditioned splendor. It quickly became my go-to Vietnamese restaurant in Cambodia’s capital city. 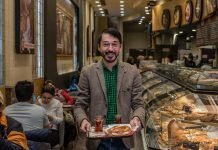 Soon after arriving in Ho Chi Minh City on a trip through Vietnam last month, travel partner Tom and I made went in search of authentic Saigon pancake. By the time we saw cooks in a windowed kitchen pouring, flipping and folding a steady procession of the crepes as we entered the restaurant, we pretty much had just one thing on our minds. The menu choices were many and included veg-only options, but we wanted to try the most traditional: Saigon-style with slivers of pork belly and shrimp. A basket of mixed leaves was delivered to our table along with glasses of cooling limeade, frosty drinks much appreciated after the steamy tramp across town. 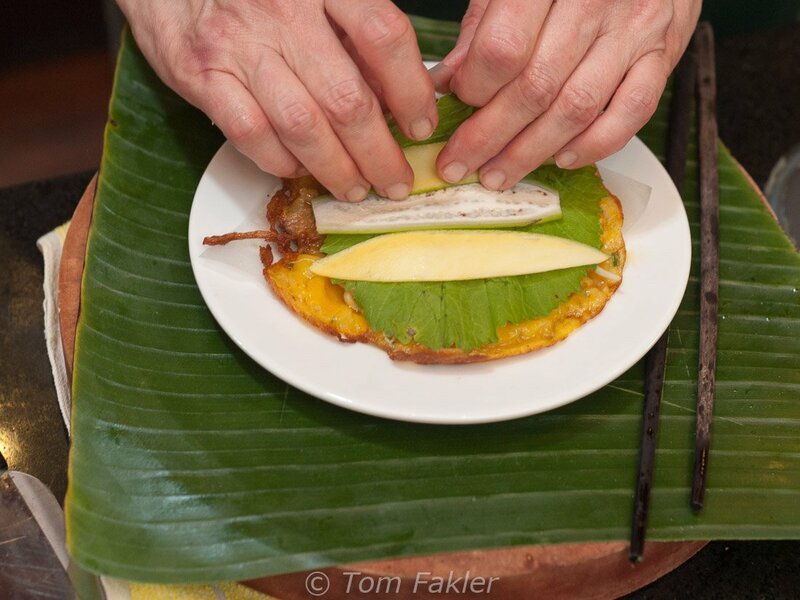 When the made-to-order pancakes arrived, we pulled each neatly folded creation into scraggly bits with chopsticks, tussled them onto a palm’s worth of carefully selected and layered leaves, and rolled everything into cigar-like “sandwiches”. Dipped into Nuoc Mam sauce, our lunch screamed flavor, crunch, and sloppy goodness. If it’s a crepe, where are the eggs? 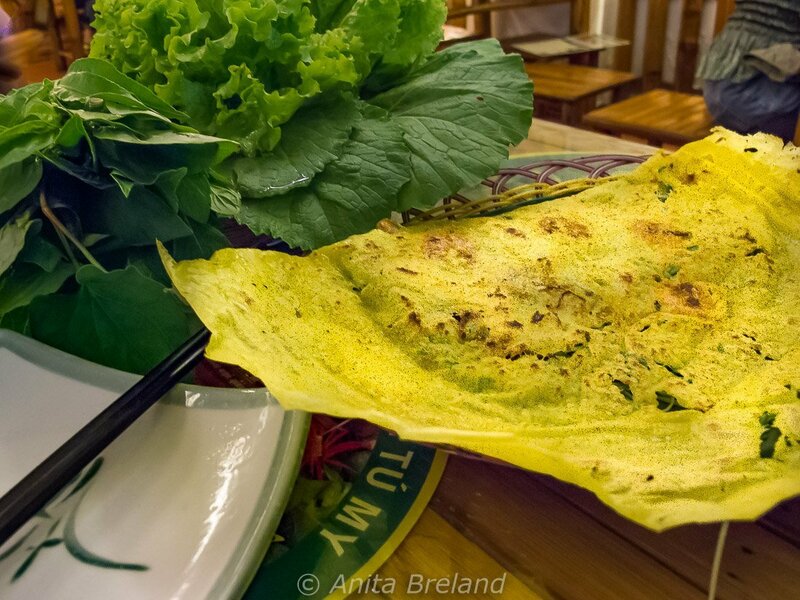 In fact, the similarities between banh xeo and a western-style crepe begin and end with shape and mouth feel. The Vietnamese specialty gets its vibrant yellow color from turmeric, its slightly sour crunch from coconut milk and fermented crispy rice flour (or in Hoi An, a batter of coconut cream, ground rice, and mung beans). 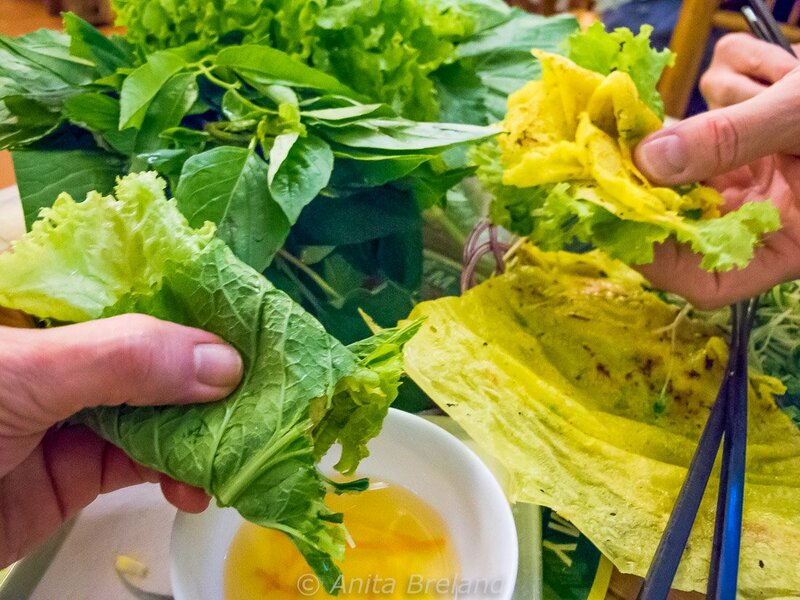 No matter where in Vietnam banh xeo is served, though, it comes with a wealth of whatever greenery the market has to offer on the day. 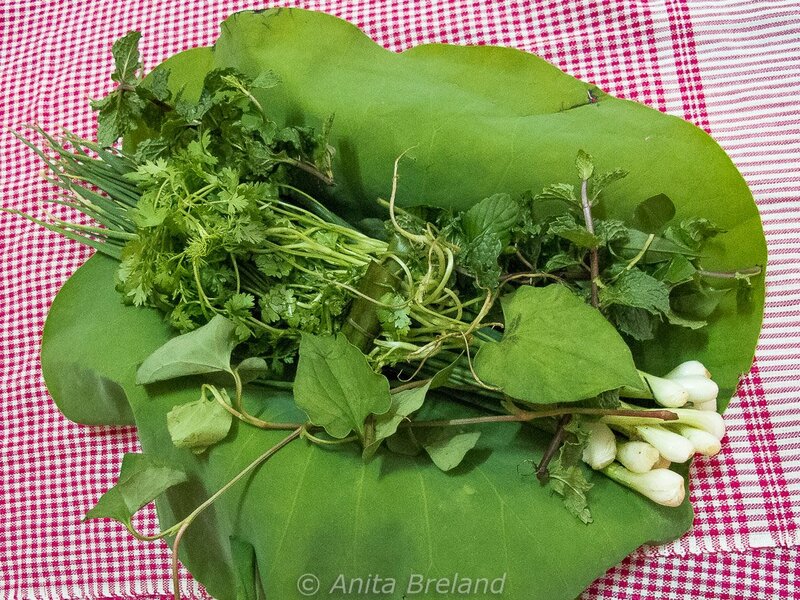 From stinky fish leaf to various forms of basil to long coriander, the leaves impart a piquant burst of ‘fresh’ to every bite. In Hoi An, a food lover’s Mecca in Vietnam’s coastal midsection, banh xeo takes on a smaller, heftier form. At Morning Glory, one of Hoi An’s leading restaurants, the pork is still there, and the shrimp, but the method of preparation and final presentation are slightly different. I learned to make these goodies at Morning Glory, folding my pancake under the expert eye of owner and cookbook author Trinh Diem Vy. In her recipe, each cooked pancake coddles thin slices of green banana and star fruit and some herbs. Wrapped in rice paper, Hoi An banh xeo is fine finger food, without some of the slosh associated with its southern relative. Banh xeo is a winter season favorite here, dipped in peanut or sweet and sour sauce with the added kick of bird chilies. This is the version I’ll want to make when I get home, using the recipe from Taste Vietnam. Banh xeo gets my vote!